All gouache on archival digital print on Hahnemühle paper, 72 x 36 inches. 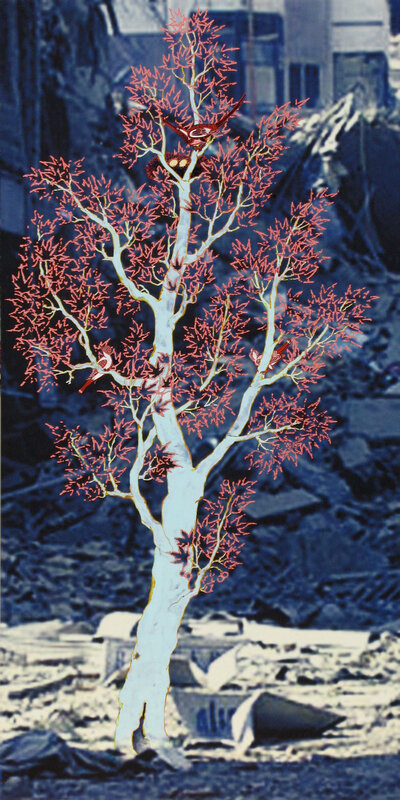 The tree is derived from Muhammadî of Herat’s painting of a peasant lecturing on patience to a wise sheik. It stands vibrant, surrounded by rubble, promising new life through the nest of eggs that it shelters. 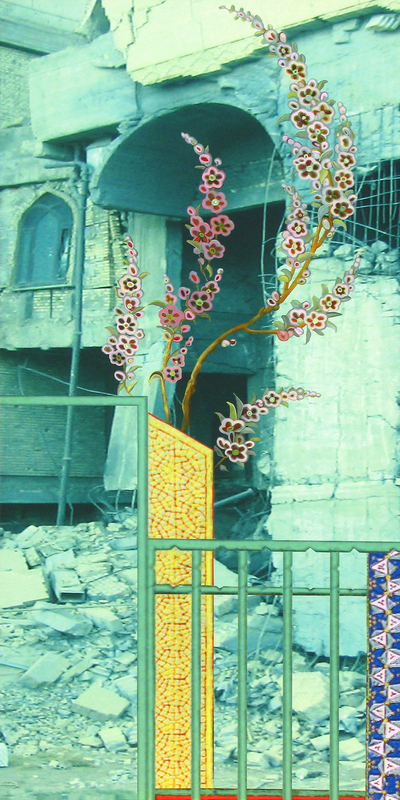 A garden gate opens to what remains of one of Saddam Hussein’s destroyed palaces, derived from a 16th century illumination showing Siyãrvush receivings gifts from Afrãsiyãb’s peace envoy, from Shah Tahmãsp’s Shãhnãmeh. “Remit” can mean to cancel, restore, defer, pardon or reduce the intensity of something. Title and image evoke the failure and hope of diplomacy—and its absolute necessity. 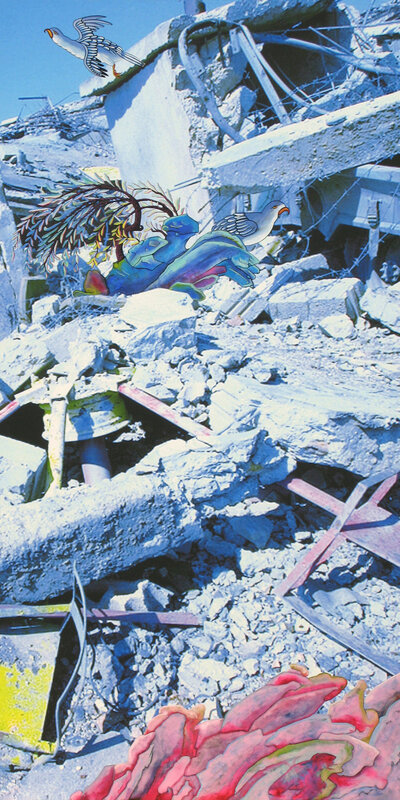 A bird struts before the rubble of Beirut, bombed in 2006 by the IDF. 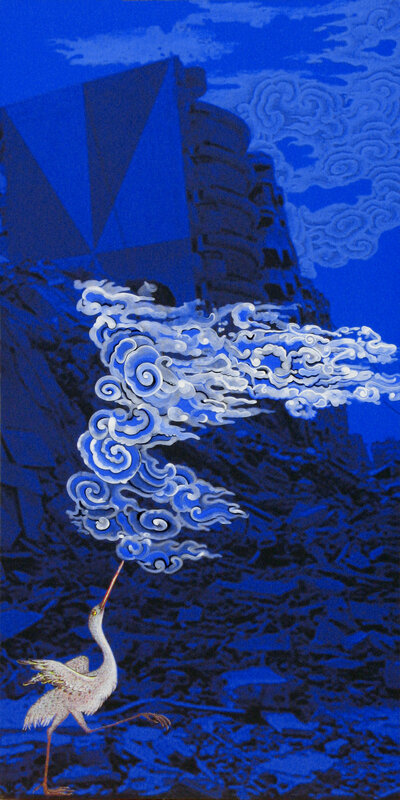 Painting and digital processes are deliberately confused with elements of Persian paintings faded or magnified by Photoshop and the elaborate cloud balancing on the bird’s beak painted in gouache. It is the most physical, yet a mirage, a figment of our imagination. Source: Page from the manuscript of the Kitab al-Hayawan (Book of Animals) by al-Jahiz in the Biblioteca Ambrosiana, Milan depicting a brooding ostrich. Tree from The Son Who Mourned His Father: Page from a manuscript of the Mantiq al-Tayr (The Language of the Birds) of Farid al-Din cAttar, ca. 1487; Timurid, Iran (Herat), Opaque watercolor, ink, silver, and gold on paper,9.75 x 5.5 inches, Metropolitan Museum of Art, New York. The source illustration is associated with a story related by the hoopoe as a response to a bird who complains about his fear of death. In the story, a son grieves the death of his father in front of his coffin and a sufi soothes him, explaining that his father had experienced much pain and that no one can avoid death. The scene is the August 2003 wreckage of the Canal Hotel in Baghdad where, on August 19, 2003,at least 22 people, including the United Nations’ Special Representative in Iraq, Sérgio Vieira de Mello, were killed and over 100 were wounded. The blast targeted the U.N. Assistance Mission created just five days earlier in the hotel that the U.N. has used as its headquarters in Iraq since the early 1990s. Superimposed motifs from Jâmî’s allegorical romances and moral parables insist on beauty and civility in face of the worst human behavior. Architecture from Zulaykhâ’s castle by Bhizad for the Manuscript of the Bustân, National Egyptian Library, Cairo, Folio 52v; photo: M. Asser. Photo source: Aftermath of IDF attack on the Saleh commercial center, Ghaziyeh, Sidon inLebanon. The laundry derived from Bihzâd’s 15th c. illumination, Caliph al-Ma’mûn in his bath, hangs above a place in Lebanon devastated by war, reminding us of how, following trauma and catastrophe, the ordinariness of our daily lives becomes extraordinary.